I wrote an account about Coping with my Child's Eczema. You might want to read that post first, as it links to this page, and my other posts on Eczema. I wrote an account about Coping with my Child's Eczema. You might want to read that post first, as it links to this page, and my other posts on Eczema. My dear Bubbles has been coping with Eczema for a couple of months now. She has it on the joints of her arms, the back of her knees and her ankles. After several weeks of re-working her diet, eliminating foods, changing her bath soap and slathering on moisturisers, I decided enough is enough and took her to the PD today. She referred us to get a skin prick test done to help determine possible allergens. I made sure that we tested her for stuff that we suspected she is allergic to - dust mites, tomatoes, wheat, fish, chicken and eggs. I also added on to the list more than the usual recommended stuff just to be sure. There were 20 things in total that were tested for. This meant 20 pricks on her back! While the pricks are not painful, they are not comfortable. Thankfully my dear bubs was cheery through it all, playing with a little bell given by one of the nurses while allergens were being pricked onto her back. I was hoping to see some positive results just so that I would know what to eliminate to solve her eczema. This just means I'll have to figure out other ways to do this, starting with even more intensive moisturising and turning off the skin-drying air-conditioner when she sleeps. I pray she outgrows this soon! Have you tried John Chiam @ Ghim Moh? No - is he good? /What kind of doctor is he? PD/Allergy etc? Oh dear Bubble! Hope she outgrows of it soon! My boy had it at about 15 months, he suffered quite a bit for a few months, then he outgrew it after that. We didn't do anything except changed his body and hair wash to California Baby and apply CB mosturiser and the Calendula cream diligently (until now). His skin is dry at times, but didn't have any outbreak of rashes since. Hope you find something that works for Bubble. baby has eczema too. got it frm me. when she was 2 mths old we even brought her to NSC. now it's not so bad.. patches here and there. u can try physiogel or physiogel AI (need prescription). heat can be a factor too. It does seem rather common! Thanks for sharing your experiences and giving suggestions. I'll write more about this as soon as I find the time so that we can all discuss how best to help our bubs! ya i have some posts on baby's eczema too. can check them out if u like heh. Thanks Charmaine! I'll check out your posts. Erm, I'm not keen to get another item in the house! haha. We'll seeh how the no air-con thing pans out. heard Aqueous cream is good for eczema. Neil's niece used to have it. Corsage, I was thinking to myself "phew, how lucky Bubbles is to be tested negative for everything". 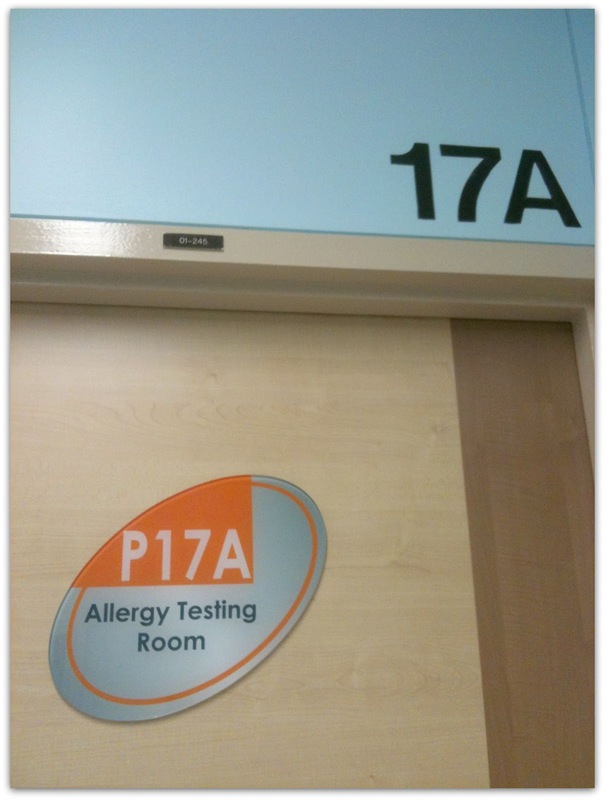 Mine already tested positive for 4 out of the 6 allergens at his first test. Since she is not reacting to any of the allergens, perhaps its her bath soap or moisturizer or clothing detergent or clothing that's causing her eczema? I suggest you could experiment with different bath soaps. If you don't already know, brands like J&J are a no go. When the eczema is very serious, consider just using plain water to bathe her. Temperature cannot be too hot as hot water will aggravate the itch. One of the mildest soap I've used before is "soft touch minus" (prescribed by a clinic at Redhill - supposedly milder than Cetaphil). It's troublesome to get it so nowadays since my boys are slightly better I've switched to Cetaphil. Paige (fellow Sep 09 mummy with quite serious eczema herself) swears by Pinetarsol but I haven't tried that myself. By the way, powder is usually also a no go for eczema. As for clothing, choose 100% cotton clothing. I can't advise too much about the moisturizer brand though. I've been experimenting on a couple for my boys and myself but I haven't found the 'perfect' brand yet.